The first sound of the universe is an expression of surprise. It is the first of the Sacred Sanskrit Syllables and the entire universe arises from it. The Sanskrit alphabet, like many others around the world, begins with the letter “A” and it sounds like the “a” in father or the “u” in up. You will find it written in the literature as ah, but since it is holy, I write it as AH to separate it from the mundane. Everyone in the world is familiar with the AH sound and produces it regularly. AH is a natural expression of the body… AH just comes out, produced by the body. Say a person is very thirsty and drinks some water, quite often the AH sound will follow… naturally produced. Think of a time when you were struggling for an answer to a problem, and all of a sudden a light flashes and the answer is right there… quite often the sound of AH accompanies the experience. The syllable expresses delight, surprise, satisfaction, pain, and so on. AH is a natural and unconscious expression of the body, and I guess that is not surprising since AH is the first sound of the universe and everything is connected to it. 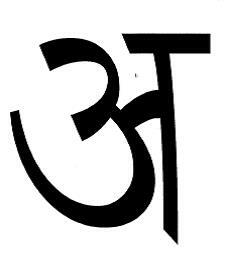 Because AH can express so many states, the Veda says to produce the sound in the fourth note of the scale, the key of F.
Perfection in pulsing the Sacred Syllable of AH clears the path to heaven, so when the Sacred Syllable was replaced with OM, enlightenment became impossible and no one upon the earth has become awakened since. The Sacred Verses of Heavenly Father describe the techniques, but as yet, no one has perfected the way. Information about such things can be found among the many pages of this site. For instance, in the Section called “Home” you will discover an Introduction to the Rigveda and the Rgvedaschool, and in the section called “Enlightenment: Techniques” you will find information about Prostrations, Meditation, Mantra Recitation, and so on. Here is a verse from the Sacred Text to enjoy with the breath of God. To have the power to run here and there because of the wind and to speak the knowledge of, the wisdom of the Illustrious is to obtain and just as to drive AH to, to gift and One to praise with delight, and with compassion in the heart the God of Love is honored to be present.